Hercules, CA — January 12, 2015 — Bio-Rad Laboratories, Inc. (NYSE: BIO and BIOb) today announced the launch of the ddPCR™ KRAS Screening Multiplex Kit, the latest offering in the company’s Droplet Digital™ PCR line of predesigned, fully wet-lab validated assays. The ddPCR KRAS Screening Multiplex Kit offers improved sensitivity and simultaneous detection of the seven most common KRAS mutations in a single ddPCR experiment. KRAS mutations are found in 90% of pancreatic cancer cases and 30% of colorectal cancer cases, making it a gene of great interest to cancer researchers. The Multiplex Kit is able to detect and quantify extremely low levels (down to 0.2%) of KRAS mutant DNA in a single assay. Cancer samples are often available in limited quantities. Using the Multiplex Kit, researchers can derive results from low amounts of starting material. Bio-Rad’s ddPCR technology provides an absolute measure of target DNA molecules without the need for a standard curve. Together with the ddPCR KRAS Screening Multiplex Kit, this technology enables detection of a single mutant molecule in a background of 2,000 wild-type molecules (0.05% mutation frequency). Measuring these extremely low levels of mutation abundance could lead to the development of new, less invasive and more sensitive cancer diagnostics. ddPCR KRAS Screening Multiplex Kits are compatible with all of Bio-Rad’s Droplet Digital PCR Systems, including the QX200™ AutoDG™ Droplet Digital™ PCR System. 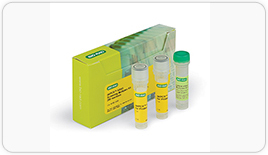 For more information on Bio-Rad’s ddPCR KRAS Screening Multiplex Kit, please visit www.bio-rad.com/KRASpr.